A work permit as necessary. W-4 Instructions: Since most of you work in the summer and go to school during the school year, you won’t earn enough to be required to pay federal or state taxes ($8,500). Thus, on line 7 of Form W-4, please write the word EXEMPT. If you are employed year round and are subject to income taxes, please complete the form as indicated. You may also choose unique percentages for Federal and State deductions based on your annual income from all sources. Work Permit Instructions: If you are under 18 years of age, a work permit must be on file. You do not need a new one each year–once is enough. Please enter the Employer’s Information as shown below. Submit the form, then open the permit that is generated, sign it, have a parent sign it, and return it to our offices. 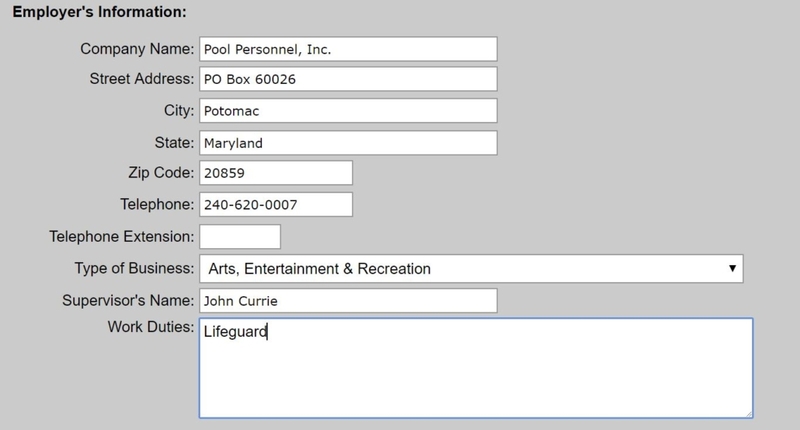 Do not leave these forms at your pool.